Along with other business, all the information is contained in the press release in the link bellow. 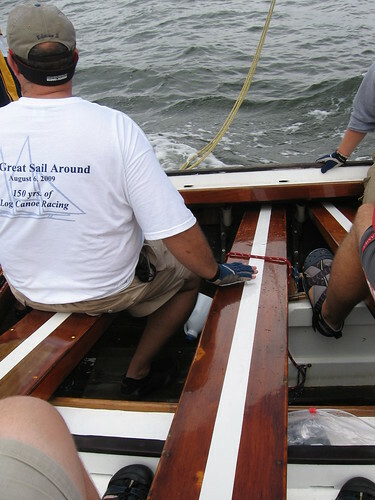 The Heritage regatta was canceled for the year due to Hurricane Irene headed for the Chesapeake bay. No make-up races are scheduled. The forums have been fixed and are ready for discussions!! A measurer is still needed, to officially measure all the log canoes in case any of the ratings need to be changed. Warning signal for the first race on Saturday July 9th is at 10am, with a 10:10am Start. Warning signal for the second race on Saturday July 9th is at 2:30pm, with a 2:40pm Start. Warning signal for the third race on Sunday July 10th is at 10am, with a 10:10 Start. Miles River Yacht Club Governors Cup Weekend July 30th and 31st. Chesapeake Bay Maritime Museum Bartlett Cup September 18th. *Skippers meeting is scheduled at 9:00 am on Saturday. The first race scheduled on Saturday, August 14th for the Log Canoes is set for a 10:30am warning signal. The second race for Saturday, August 14th is set for a 2:30pm warning signal. On Sunday August 15th the race is scheduled for a 10:30am warning signal. The Races will be held on the Chester River, and officiated by the RHYC race committee. On Saturday there are two races scheduled, the first with a warning signal at 10:00am and the second race is scheduled with a warning signal at 2:30pm. On Sunday there is one race scheduled for 10:00am then a lunch break and award ceremony scheduled thereafter. There will be two races on Saturday July 10th the first race with a scheduled warning signal at 10:00am and a second race with the warning signal at 2:30pm. On Sunday there is one race scheduled at 10:00am then a lunch break and award ceremony following that. Well it's finally here, the start of the 2010 Log Canoe Season! Today (Saturday June 26th) there will be one race, starting at or around 2:30pm. Then two races on Sunday (June 27th) I'm assuming that the first race will be a 10:00am Start and the second race will be a 2:00pm or 2:30pm start. The winter was pretty intense this year and Canoe season came up very quick, which is a nice alternative to 22 inches of snow. This will be our 151st year of organized Log Canoe Racing which we are all proud to continue the tradition. The JayDee has been stripped down, and refitted (restored) this winter and sailed her first sail last night. Successfully!! It is not only exciting to see a Log Canoe get restored and become faster, stronger, better, but also this will add another 20-30 years onto her life span for the next generation keeping this ancient sport alive. Come down to the MRYC or the Miles River today around 2pm and support the Log Canoes! NODDY is looking for a few good boardmen. We plan on sailing most of the weekends this year and consistent experienced crew makes the difference! Please contact Brad Johnson at ....Bdive4fun@aol.com.....or my cell --410-708-0769.. Check out the Race Schedule page for the 2010 racing schedule! Kyle Leaverton, a boardman from Mystery and film student at Wilmington University, is making a documentary about the Chesapeake Bay Log Canoes as a whole and need yours help! Kyle is looking to interview anyone involved in Log Canoeing, especially those who have owned and sailed for many years. He is also looking for any pictures and stories, which I'm sure there are quite a lot out there! And if anyone has any footage/video of a Log Canoe under sail or a race that would be awesome as well. Kyle will be available from April 3rd to April 10th to interview anyone interested in participating in this project. It's my 28th Birthday today so everyone celebrate! Update: [06/20/2010] Jay Dee is all finished and was luanhced friday June 19th at the MRYC, she is sitting on her trailer and Canoes Harbor awaiting the start of the racing season. The mighty Jay Dee was taken to Campbell's Boat Yard in Oxford hauled out of the water flipped over and stripped of her fiberglass in the effort to remove excess water and preserve her for generations to come. The project will take most of the winter and is very exciting for the fleet to keep the Canoes maintained and racing! Check back often as I will be updating the slide show as the progress continues..
From Duke Adams, "John West, foretender and boardman on Patricia and then Oliver's gift for over 35 years died early January 2010 from pancreatic cancer. He was a great friend, crew mate, and honest gentleman and will be missed by all that knew him. -Crew of Oliver's gift"
Edmee S. will be sailing all day at the small craft festival, and she will also be taking on guests who want to experience sailing a Chesapeake Bay Log Canoe! One of the most popular gatherings of small and unique water craft in the U.S. – the 27th Mid Atlantic Small Craft Festival –takes place at the Chesapeake Bay Maritime Museum on Saturday, October 3, from 10:00am – 5:00pm. More than 200 unique small craft will be on display, including kayaks, canoes, paddle boats, rowing shells, sailing skiffs, prams and the unusual “one-of-a-kinds.” Proud boat owners – many who hail from ports up and down the East Coast—will offer boat building demonstrations as well sailing, paddling, and rowing competition. The Museum’s boat yard staff, and instructors from the Chesapeake Wooden Boat Builders School, will also be on hand to offer maritime demonstrations."